While most people recognize Wilson Sporting Goods and the Wilson brand, not as many realize that today Wilson is part of Helsinki, Finland-based Amer Sports, a global company with roughly $2.7 billion in net sales for 2012 and a sales network in 33 countries. Amer Sports uses five “strategic cornerstones” to achieve this success, one of which is operational excellence. But they were having difficulty fulfilling customers’ orders from their Nashville distribution center – so they turned to Outsource Equipment Company to provide some warehouse picking solutions. Amer Sports is one of the leading sporting goods company in the world, with brands including Wilson (racquet sports, golf and team sports), Salomon (winter sports equipment, footwear and apparel), Atomic (winter sports equipment) and Precor (fitness equipment). Odds are you’ve personally worn held, or used something they’ve produced. The company sells its products to sporting goods chains, specialty retailers, mass merchants and fitness clubs, as well as directly to consumers through brand stores, factory outlets, and online. Amer Sports’ strategy emphasizes excellence in consumer-centric product creation. Through continuous research and development, the company seeks to develop new and better sporting goods that appeal to consumers and its trade customers. Products are designed to improve the performance of all athletes (from beginners to professionals), help them achieve their goals, and provide them with more enjoyment from their activity of choice. In 2012, Amer Sports started a restructuring program to drive further scale and synergies and cost efficiencies, as well as to sustain growth through resource allocation especially into soft goods and expansion markets and channels. The program is estimated to deliver an annual cost saving of €20 million once fully executed by the end of 2014. But a certain 400,000-square foot distribution center in Nashville was having efficiency challenges. Amer Sports was storing products in 25-foot-tall pallet racking down long aisles, which they would stock by pallet load with narrow-aisle reach trucks or by carton with operator-up order-selector vehicles. They used the same operator-up vehicles to travel to the product selection location and retrieve the items for orders one line item at a time, which was taking too long time and was unproductive. They needed a way to store the products closer together, as well as a means to pick the items for customer orders and get them to the pack area fast and accurately. They had tried a few alternatives like single-level carton flow rack, which did help for some fast moving items, but with the seasonality of their sporting goods products this did not provide the long-term solution they wanted. Amer Sports approached Outsource Equipment Company for a solution. Outsource Equipment looked at several alternatives and, in consultation with the team at Amer Sports, decided on a three-level rack-supported pick module. 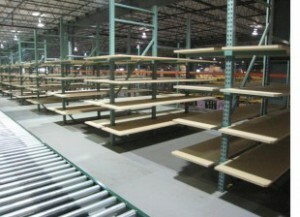 The chosen module consists of carton flow racks for fast-moving items, 10-foot-wide shelving for medium- to slow-moving items, and pallet storage locations for back-up replenishment stock. 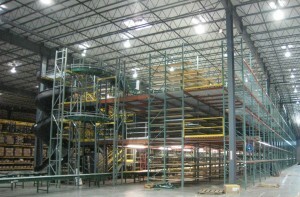 The pick module is fed on each of the three levels with its own conveyor. Orders typically begin outside the pick module with a few picked items in the pick box and are then placed on the appropriate conveyor (going to level 1, 2 or 3) for picking of the specific products from that level. The operator receives the carton, which has a pick list inside, and they pick the items requested from their pick zone – so they are not traveling long distances to make picks. The conveyor in the middle of the pick module is powered with gravity conveyor side leafs for staging orders to get picked. When the operator has completed picking the order for that carton, they push the carton onto the powered take-away conveyor and it is then transported to packing stations on the first floor. If the order is on second or third level, it is merged onto a gravity spiral conveyor that leads to the first-level conveyor, with a traffic cop device that controls the flow of the two merging lines into one. The benefits of the pick-module system are: • Increased labor savings • Better space utilization in the facility • Increased accuracy (because operators work a zone within the pick module and they get to know the products they are picking) • Less walking and fatigue • Faster order processing (which increases customer service levels while not requiring overtime from staff) In an interview about efficient global operations and complexity reduction on the Amer Sports website, Antti Jääskeläinen, chief development officer and SVP, supply chain & IT, had this to say: “There has been great progress in recent years and the whole Amer Sports wide operation around the physical flow of goods and information is a machine with a built-in drive for continuous improvement. … But we are of course never satisfied and want to continue improving all aspects of our business and processes.” Outsource Equipment Company is proud to provide ongoing support to Amer Sports and play a part in their present and future success as they strive for continuous improvement. Contact us for help with your own warehouse picking solutions!